Our centrally controlled material flow computer optimizes your throughput, routes bidirectionally and prevents deadlocks and livelocks. In the event of failures, the integrated replay function brings your system directly back into operation and, thanks to its modular design, it can be easily adapted to your requirements. 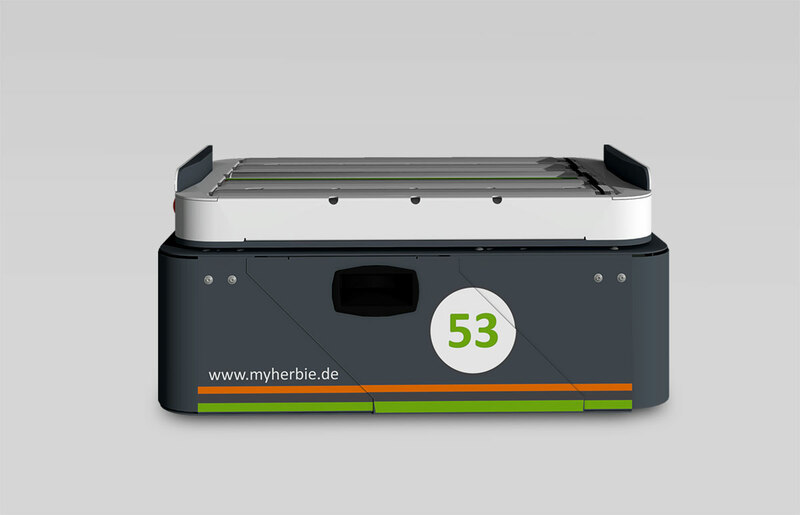 Possible applications include 3D shuttle, AGV or classic conveyor technology. In order to configure our material flow computer ideally to your requirements we can fall back on a wide range of different modules in different areas, such as routing strategies, strategies for warehouse management or strategies for order optimization and processing. The material flow computer can thus be very rapidly assembled to suit your needs. It has an open interface to various databases (MS SQL, MongoDB,...) as well as standard interfaces to your hardware (shuttle, lift, continuous conveyor technology,...). Safety is also paramount for us – which is why we integrate systems that serve your functional safety. 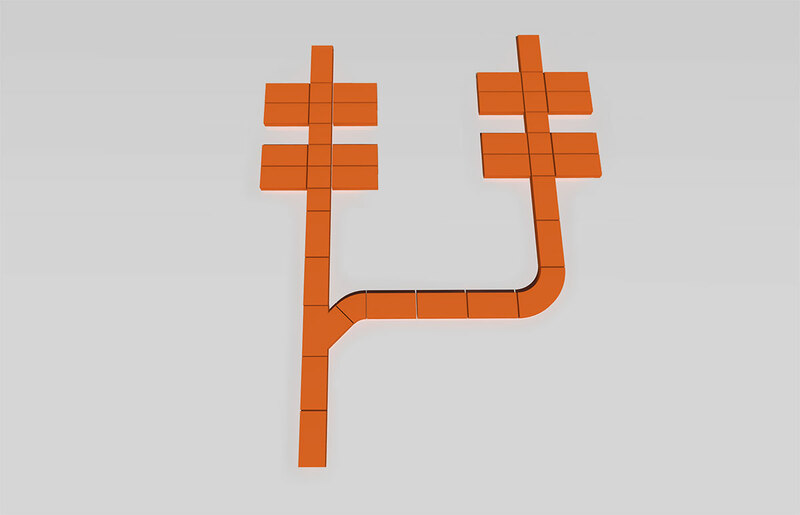 What makes the material flow computer so special is its efficient transport route calculation. We are the market leader in routing strategies for online deadlock and livelock avoidance in complex / novel material flow systems (e.g. 3D shuttle). The system layout is described in AML (automation markup language). This enables simple and efficient further processing into a customer-friendly visualization, which can be regenerated directly after any changes. The system states of the entire system and all individual modules are persisted, enabling full traceability of all events in the system in the so-called replay function. Block-chain technology is used to ensure these system states and the transactions carried out. Faults of all kinds are detected quickly and easily. 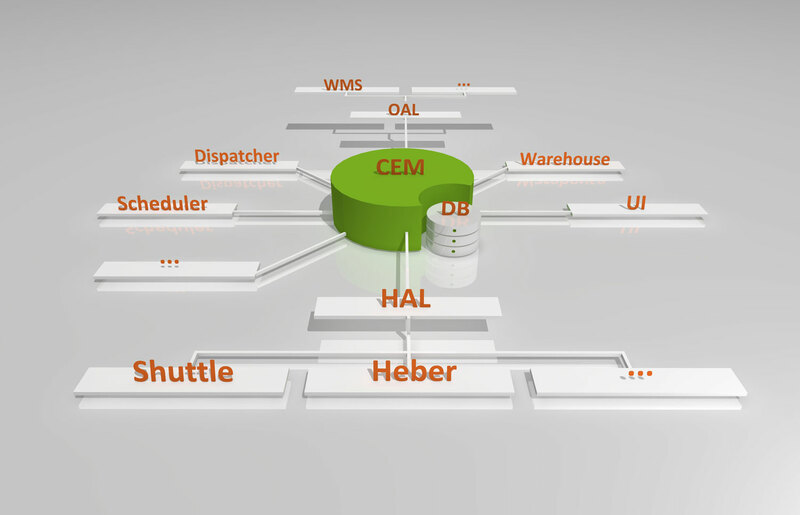 Our Command & Event Manager (CEM), which implements CQRS, is used for communication between the modules. 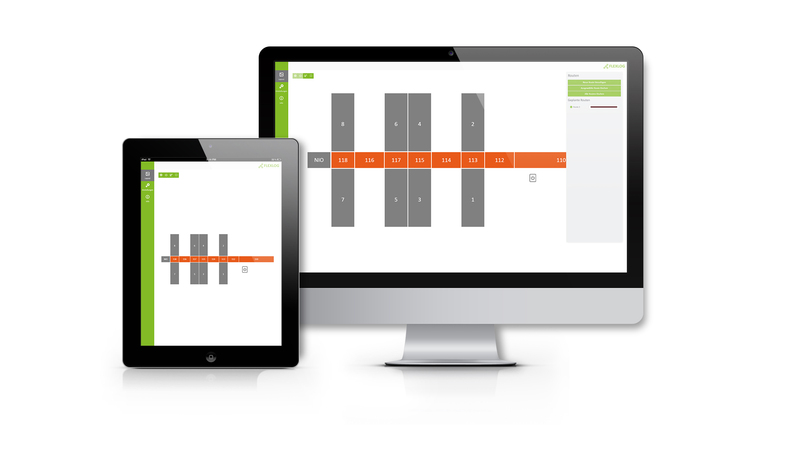 Our HTML5 visualization with intuitive layout is automatically generated by describing the plant layout in AML. Every change is quickly and easily adjusted for. You not only receive a clear display of all system statuses and tracking information, but also an overview and detailed layouts of the entire system. The multi-touch-enabled web app can handle any browser and is therefore independent of end devices (tablet, PC, smartphone). Where is the material flow computer used? 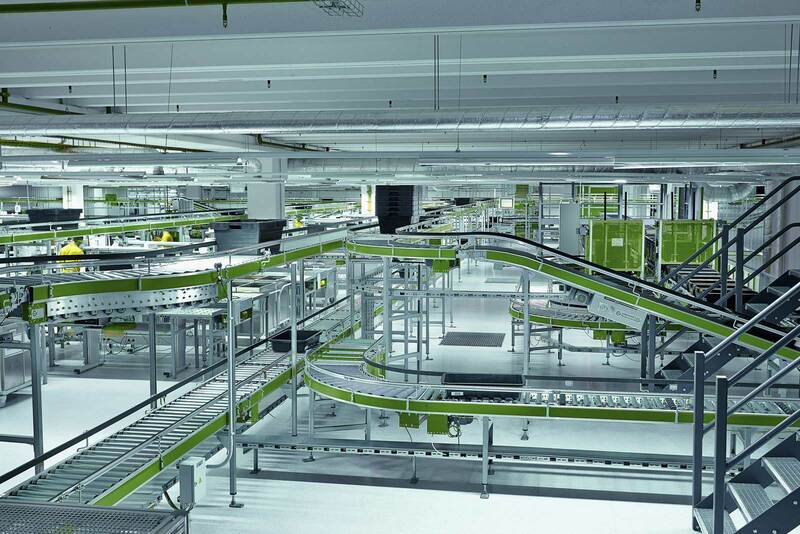 The material flow computers from flexlog controls any number of driverless transport systems, even in complex environments. With our Herbie, flexlog also offers an all-round package that is tailored to your specific application. 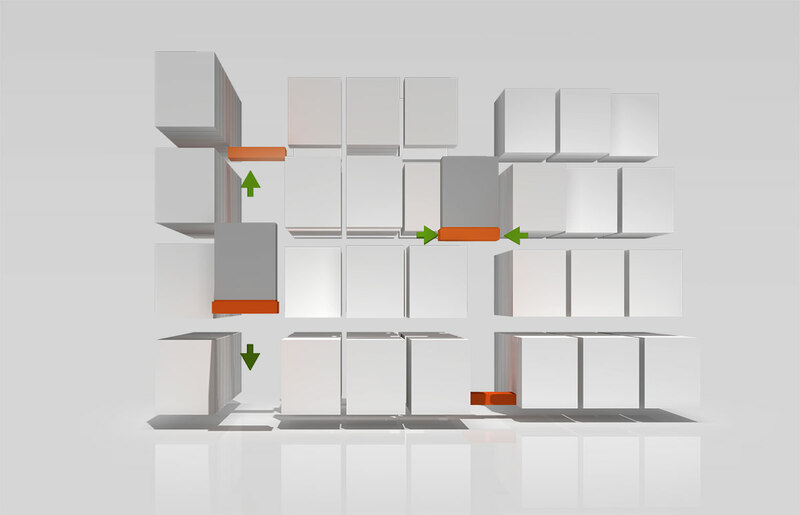 No matter how many shuttles there are in the warehouse, whether conventional shuttles oder 3D-shuttles, the flexlog material flow computer reliably routes them, free of live- and deadlocks, unidirektionally through the warehouse. As awarehouse pre-zone conveyor system or as an independent system, the flexlog material flow computer is very versatile.